Every couple steps we took it seemed like something important was happening--a protest, an interview, a press conference, a meeting. Everything felt important, powerful. In Nashville, it seemed like everyone was working hard at getting discovered. In Washington D.C. it seemed like everyone was working hard at getting heard. In a funny way, the energy, urgency felt quite similar. In both cities, everything felt important and powerful. From the band trying to to make it in the dive bar or the kid who ran away and was proving how funny he was by selling jokes on the street in Nashville to the men (and a couple women) in suits taking meetings to discuss environmental policies and regulations--everyone had something to share/sing/say. In both cities, my kids and I walked around with eyes as big as saucers, easily revealing our we aren't from here identities. In both cities, we were only there for a short time, but we were there to take everything, all of everything in. Our hearts and minds were open as big and wide as our eyes. 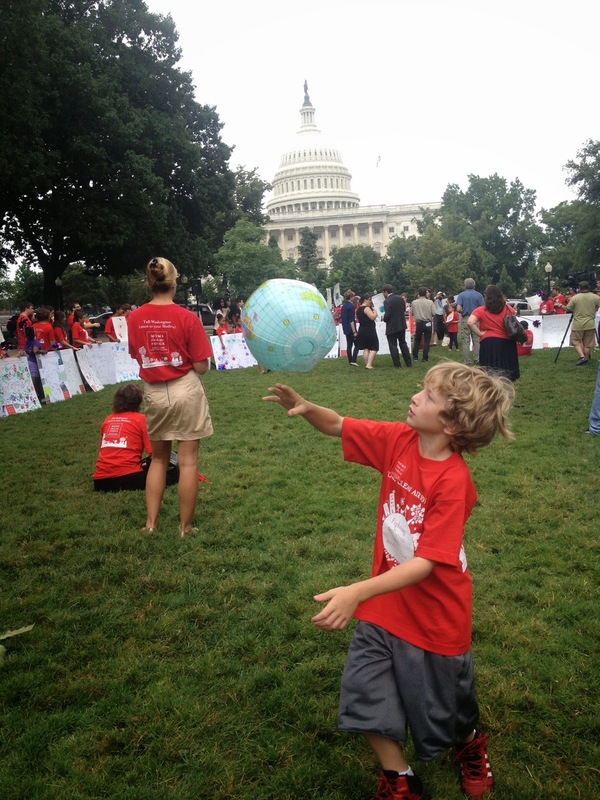 We were invited to Washington D.C. by Moms Clean Air Force (MCAF) to participate in a protest. The protest was to encourage members of Congress to support the Environmental Protection Agency's proposed antipollution rules, which seek to cut carbon emissions from power plants by 30%. Our flight got into D.C. the day before the protest so we had some time to explore. I knew we wouldn't have time to see a lot, but we crammed as much as we could into an afternoon. We walked and walked and walked. It was hot. Like the kind of hot where people walk around with pained expressions on their faces and look confused. But the kids were troopers, they really didn't complain at all. Red-faced and sweaty we took rest breaks in the shade and in the air-conditioned museums. We got lost in exhibits that we didn't even know we were interested in...hello battle ship exhibit, truly fascinating. 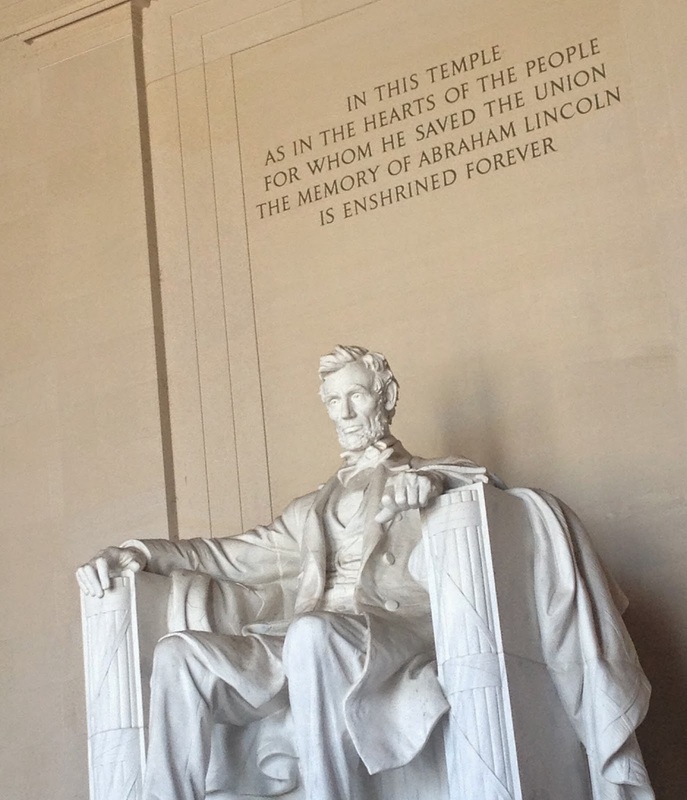 Our goal of the day was to get to "Abe's house," that's what JT called the Lincoln Memorial. 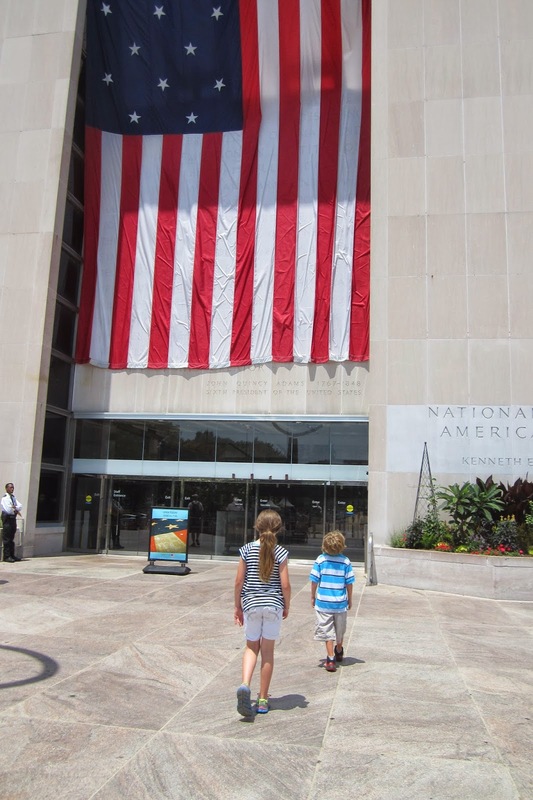 We almost gave up on our quest to see Abe because it was so incredibly hot. It was so hot people were literally passing out. "I am not getting this close and not going," I told the kids. "We have to keep going." We did. And even though there were a million people sitting on the steps, walking around the statue and mulling about, it was almost peaceful and serene. 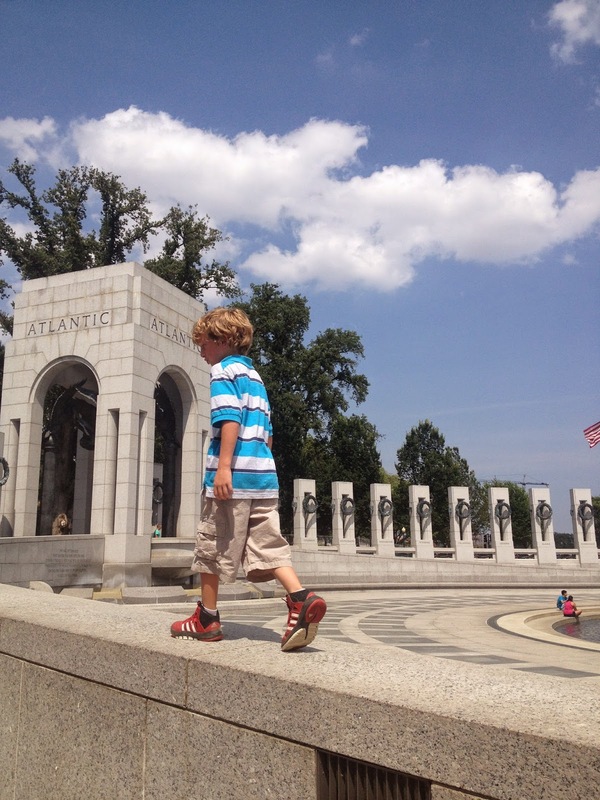 The kids and I made our way to the side of the monument where no one was. They played make believe. I watched. It felt important, powerful. After a little while, we were ready to head back to the hotel, but I was worried about making the kids walk. I looked for a tour bus, a trolley, a cab...anything that could give us a lift. The bus driver said tours ended at 5 so we were out of luck. Then I spotted the men on their bikes offering rides, actually in their rickshaws. "Let's go over there," I told the kids. "You look awful," the man said to me and laughed. "I only have $20, how far will that get us?," I asked desperately. "Oh I need to help you, get in, I'll take you where you need to go," he said reassuringly. We climbed aboard the rickshaw and sighed with relief. This man with two braids, a fisherman's cap and the best calf muscles I've ever seen was my new hero. He turned up his music and started pedaling. Do we know what it is? Hope we find what it is"
--The music, a Rastafarian rap, blared these words prophetically. The traffic flew by us. Helicopters roared overhead. We passed museums, ornate buildings, red-faced tourists, powerful men in suits. It was completely surreal and fabulous and ridiculous and amazing. The protest the next day was full of kids, moms, grandparents, activists, health care professionals and politicians. Famous senators spoke to the crowd as well as concerned volunteers. 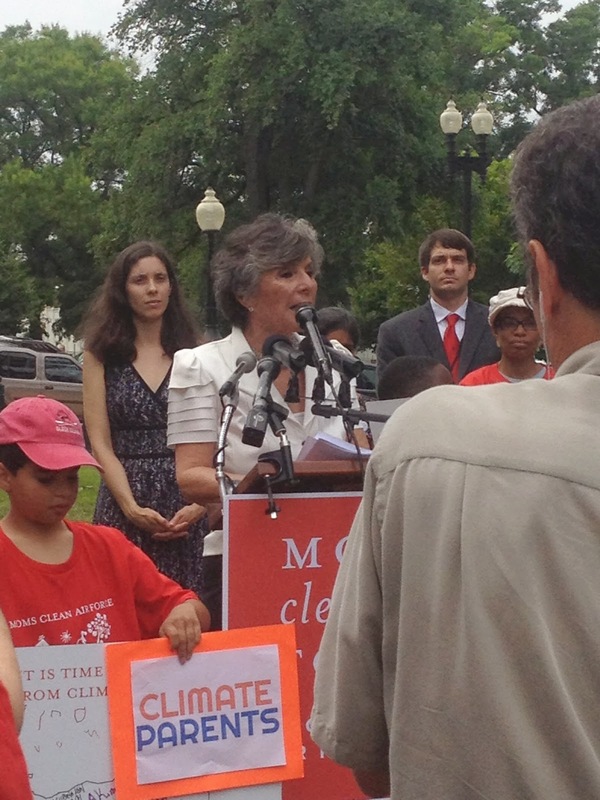 Senator Barbara Boxer was one of the speakers at the pre-protest event. 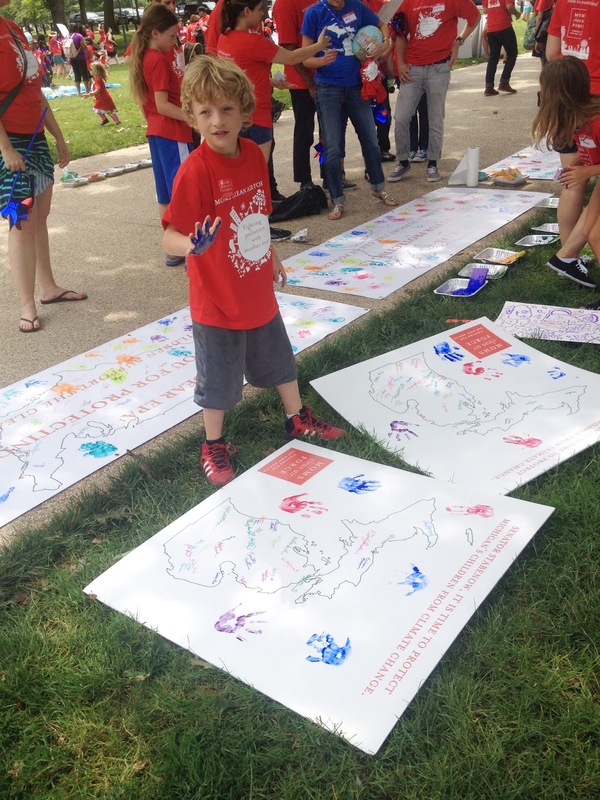 After the speakers and the games and the poster making stations, we marched to the Capitol. "What do we want? 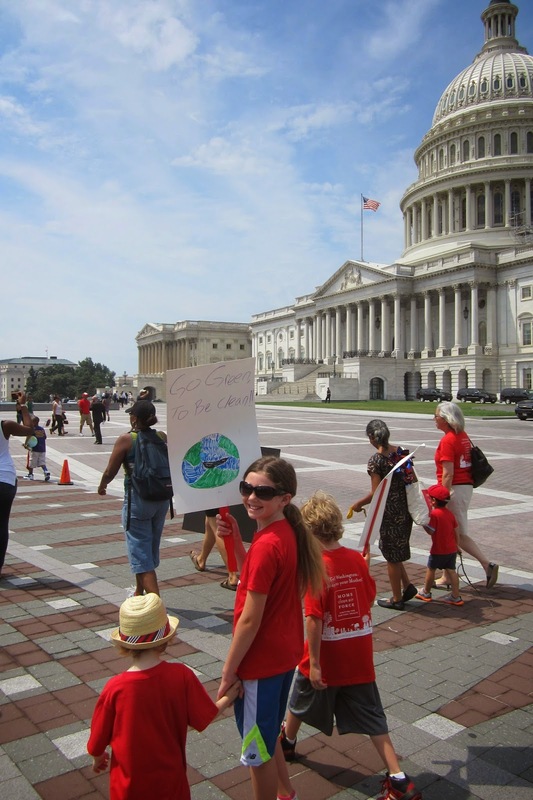 Clean Air!," we all shouted as we marched. "When do we want it? Now!" After the march, protesters had meetings with their state's representatives and senators. Lucy, JT and I, along with another family and our friend from MCAF went to our meetings. As I walked by the offices of John McCain and other senators I felt like I was in a movie or a TV show. I expected someone to yell "cut" at any minute and everyone would relax and get out of character. But nope, this was real. Passionate, hard working, busy people. Listening, talking, taking notes, nodding, smiling, connecting. Senator Kildee talked to JT about baseball and his uncle and politics. He was wonderful with JT. He showed him a picture from the baseball game between the Democrats and the Republicans. Um, who knew that happened? "Everyone was so nice here," said JT as we were leaving. "This was good." "I totally agree," I said smiling. The world is scary and argumentative and mean and full of hopelessness. But it's also full of people wanting to be heard--so many stories and jokes and songs waiting to be shared. I believe if we open our eyes and minds and hearts to all the stories, jokes and songs we'll be filled with so much nice, so much good, so much hope, so much love. That feels important, powerful. In the middle of the protest party, a man was painting a beautiful picture of the Capitol. It was like a mash up of all my favorite things--politics, hope, voices being heard, art and beauty and self-expression. Ahhhhhh!!!! During our Rastafarian rap-filled rickshaw ride home, Lucy leaned into me and showed me her bracelet. "This, mom," she said and looked up at me all red-faced and happy. What an amazing adventure! So. Cool. They're gonna remember that trip. What a wonderful experience for you and the kids! This is so cool. I'm sure the kids (and you) will never forget this. What a great opportunity to see how people can work together for a common cause.